What an adorable shot, Barb! I’m jealous of how close up you got! Hubby and I go to the Cape for our anniversary too – I’d like to walk that trail sometime; do you get there from the visitor’s center in Eastham? 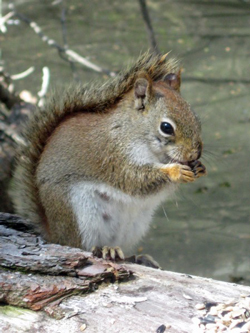 My sister was here this morning and I showed her your red squirrel picture – beyond adorable! We were laughing because the pancake was almost as big as he was, and we were trying to imagine what it would be like if we stumbled across a cookie as big as we are…. Thanks for the day brightener! Great photograph! Wonderful blog, yes those little wild creators are difficult to photograph and have minds of their own. Thank you for re-posting this blog! ‘Twas my pleasure, Jeff! I *really* wanted the chickadee pictures, but this guy was a delightful consolation prize! That squirrel was a lovely consolation prize, indeed, Barbara! It is so hard to get close to them. I remember when you posted this on Gaia. All of a sudden I am feeling heart-tugging missing that community… Hope you have a good holiday weekend! I’m touched that you remembered this post, Kathy! I miss Gaia a lot, too, but I’m thoroughly distracted and enjoying this new blogging life so much that it makes the loss much easier to bear. Happy 4th of July to you and your loved ones! Oh yes, this blogging life does make the loss easier to bear. That’s for sure!